Lillian Avenue is somewhat of an enigma, a tiny one-block street in Piedmont Heights hosting only four houses. Its namesake, Lillian H. Mosher, was herself much more of an intriguing enigma, and remains so today. As we’ve mentioned before, most Duluth streets that are named for people were given those names by the original plat-developers, who often celebrated themselves. These real estate owners were invariably men. Female first name streets are almost always named in honor of these men’s mothers, wives or daughters. Most of Duluth’s street development happened in that golden era between 1880 and 1920. Land investing was a hot commodity, and people came to the Zenith City expressly to make their fortunes buying and selling property. But by virtue of the times, few women’s names are found among the land transfer rolls. Real estate was a man’s game, mostly because married women had only recently gained the right to dispense with property they owned prior to their marriages. Once married, women were said to enter a state of “civil death,” and in most states could not enter into a legal transaction on their own account. Almost always, when a woman’s name comes up in a land transfer in early Duluth, it was that of a widow selling off land. While married women had few civil rights, none of these ownership strictures applied to single women—and Lillian Mosher never married. Because she remained single, she managed to become a major player in Duluth real estate—the only woman to buy and sell right alongside the big boys. She’s also the only one, as far as we know, to name a street after herself. Today’s media often celebrates women, particularly their business accomplishments, and Duluth even boasts a magazine dedicated to that task. Not so in 1900. Outside of trouble with the law, stories about women generally appeared in the society pages, which reported on weddings, teas, and Bridge parties; the doings of older single women like Mosher simply didn’t rate discussion. As a result, we know far more about Mosher’s male relatives than we do about Mosher herself. Mosher was born in 1862 in Elmira, New York, the eldest daughter of a fairly successful farmer. She came to Duluth in the wake of relatives—relatives who became prominent in Duluth civic and business affairs. They were, in fact, king boosters in a land full of big talkers, traveling nation-wide to encourage investment in Duluth. Mosher’s uncle, John Dana Stryker, came to Duluth in 1886. He was a major early developer, and his name is still plastered all over plat maps. He was also a founder of the Duluth Board of Realtors, and a longtime director of the YMCA. Today his name has the misfortune of being hung on what became Duluth’s most polluted waterway, Stryker Bay. He made his first Duluth real estate purchase in 1884. Shortly thereafter he joined Stryker, Manley & Buck Co., and in 1892 formed a partnership with E. C. Little. He also acted as director of Scott-Graff Lumber Co., the McDougall Terminal Co. and the Edgewater Land Co. His most notable role was as the public affairs man of the Duluth Commercial Club, where he became largely responsible for establishing Jay Cooke State Park. These two men obviously greatly influenced Mosher. Her name appears in land transfer notices in newspapers just before the turn of the century, right around the time her sister and brother-in-law set up housekeeping in Duluth. Indeed, at various times she owned significant property in Duluth’s Third Division, Harbor View’s First Division, Merritt’s Addition, and on Rice’s Point. She also invested in the Cuyuna Iron Range. It is unclear whether Mosher came to Duluth to make it her home or to simply conduct business—or if she merely invested through her relatives’ firms. She is not listed in city directories or census reports as owning a home in the Zenith City. In 1916, the society pages mention “Miss Lillian Mosher” had arrived to stay with the Noltes “indefinitely,” which census reports indicate lasted until at least 1930. Her life at the Noltes’ home on Wallace Avenue remains cloudy. We know she donated to the Children’s Home in Duluth in 1922 and that the Nolte household was a hotbed of women’s suffrage activism; a series of teas were held there for the discussion of such matters. Henry Nolte’s unusually respectful treatment of women was a frequent topic of conversation in Duluth newspapers. A 1915 article reported that a gathering of women at the Commercial Club erupted into surprised applause because he addressed the crowd as “fellow citizens” and encouraged them “to do their part in the upbuilding of a better government.” We can only assume Mosher took part in these events. Lillian Mosher died in 1937 and was buried in her hometown cemetery; no obituary marks her passing. 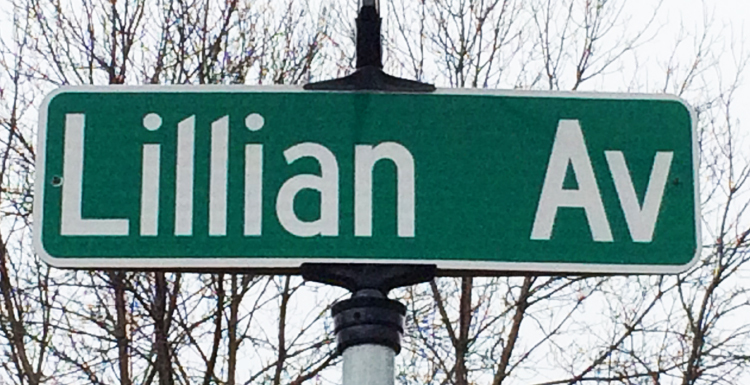 We do, however, still have Lillian Avenue—a small token of early feminine accomplishment in Duluth.